“I always prefer to book my hotel on a painfully slow website with pixelated images and questionable data security,” said nobody ever. When it comes to online hotel bookings, and every online purchase really, consumer expectations are all the same everywhere, and they’re all clear. Users expect a booking experience that is speedy, seamless, and secure. Unfortunately, there exists a significant gap between travelers’ expectations and the reality to be found on most hotel websites. 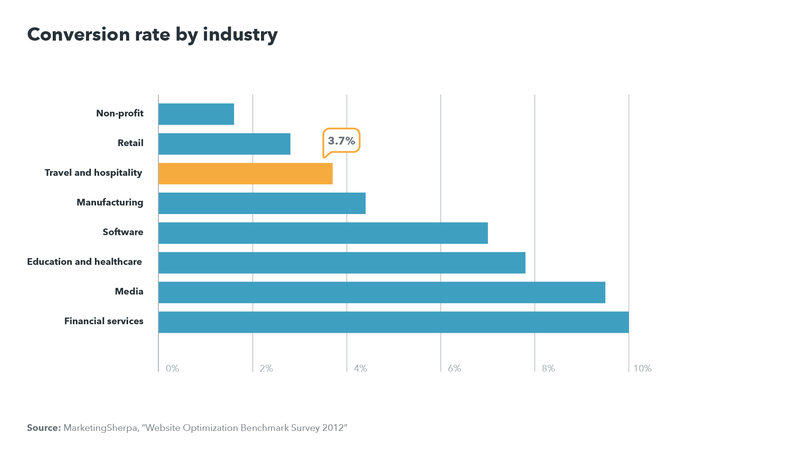 It would explain why overall travel and hospitality website conversion rates are so low — especially when compared to other industries. 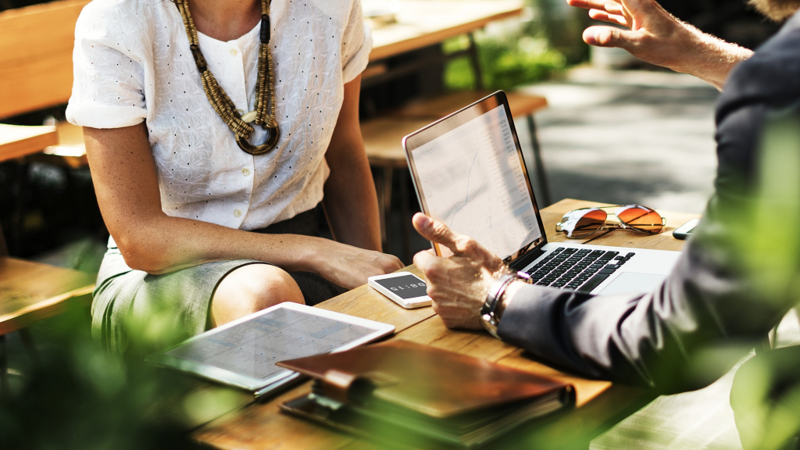 While conversion rates across the hotel industry appear to be improving, this trend belies the huge disparity between different players and on different platforms. The first thing to note is that not all devices are created equal. While traffic from mobile phones and tablets makes up an increasing share of website visitors, these devices lag behind their desktop counterparts when it comes to conversion rates and spend. It should also be pointed out that some industry behemoths are already far ahead when it comes to conversions on mobile. An analysis of the online booking market between 2014 and 2016 in the US, by Phocuswright and Jumpshot, showed bookings on desktop computers still lead the industry with conversion rates of around 10% for both OTAs and hotels. 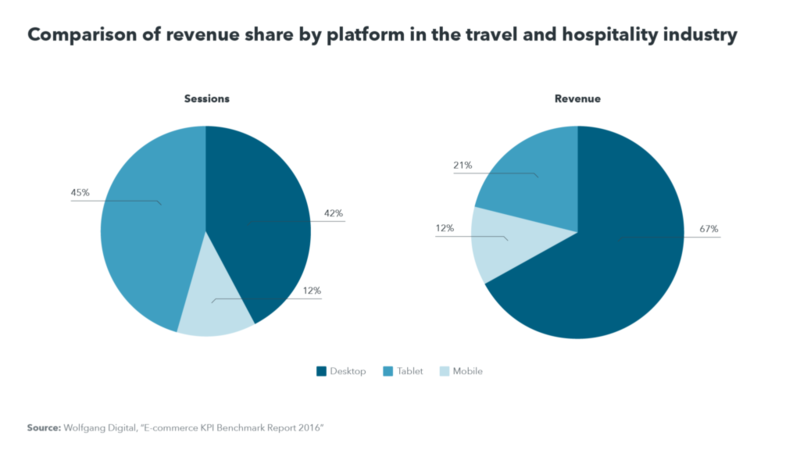 However, OTAs had a clear advantage on mobile platforms, with rates of 6 to 7% compared to hotels with only around 1.5%. 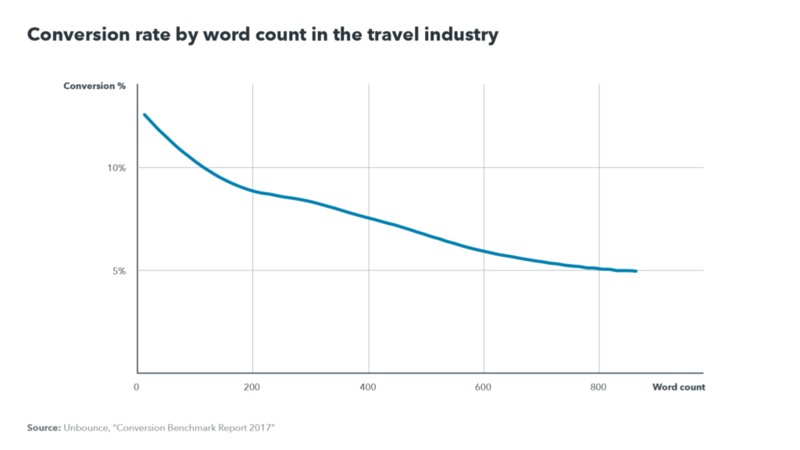 Another analysis by Unbounce revealed that the top performing 10% of travel sites have pages with conversion rates in excess of 19.7% — well above the industry median of between 2 to 5%. People want to book hotels online, and a lot of these people want to book on mobile devices. It is possible to see good conversion rates on hotel booking sites. So yes, while hotel websites have some catching up to do before they see the high conversion rates of the technologically advanced and resource-rich booking elite, there are simple and immediate actions that can already start to increase conversion rates on hotel websites. The reality is that potential guests are trying to reach a hotel on its website using mobile phones and tablets, whether the site is optimised for them or not. Winning these users starts with making sure the website content displays correctly and functions smoothly on every device. While mobile traffic still tends to have a lower conversion rate than desktop, one study from Wolfgang Digital showed that websites with more mobile traffic and revenue were still correlated with a higher overall website conversion rate. Far more important than having a mobile app is having a responsive website that works well on mobile devices, trivago’s Global Head of Hospitality, José Murta, recently revealed in a keynote discussion at World Travel Market London 2017. It also just makes more sense for independent hotels; as José pointed out, travelers aren’t going to want to download a different app for a dozen hotels. Text on the landing and booking engine pages should be limited to the absolute essentials: Every word serves to further the goal of getting the user to convert. The previously cited study from Unbounce showed that landing pages with less text and shorter vertical length tended to convert better. It can be tempting to try to win over potential guests with detailed descriptions and comprehensive information. However, users online tend to scan content and large blocks of text can turn them away, particularly on mobile. Keep text to short easy-to-digest key points, and highlight the essential information. Use clean and attractive visuals to communicate your hotel’s strengths. Move other nice-to-know details into pop-up text overlays, so that users don’t have to navigate away from your booking page. A study by Wolfgang Digital showed that average page-load time for e-commerce sites was 6.5 seconds. The optimal target for sites should be two seconds or less, with research from Amazon showing that every one-second delay can reduce conversion rates by 7%. This is even more important for users on mobile phones where connection speeds are not always reliable. The same report from Wolfgang Digital showed that page-load time had the biggest effect on conversion rates compared with other engagement metrics. Keeping site content and room availability up to date is crucial. It ensures that the site is attracting qualified traffic, that rates and vacancies are always accurate, and that the customer journey is seamless between the searching stage and the booking stage. When the rates, available dates, and content are all the same on both the booking site and the marketing channel where the traveler first found the offer, it’ll also go a long way to helping them feel safe to book. As will having the technology on the website to securely process sensitive payment information. So, to sum things up here: The stage is set for direct hotel booking conversions to take an upward turn. Provided, of course, that hotels get their websites up to snuff, up to speed, and up to the high standards of today’s digital, mobile travelers. Every step toward optimized-booking-funnel perfection is a step in the right direction. Readers can find more hotel-website inspiration in “5 Hotel Websites Inspiring Guests to Book,” more ways to optimize websites for the latest SEO trends in “The Most Important 2018 SEO Updates for Hotel Websites,” and more direct booking insights in general here on our blog.